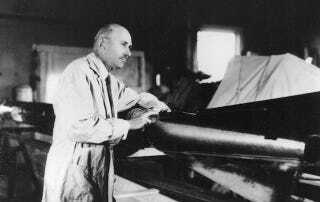 Everyone knows how Robert Goddard built and flew the first-ever liquid fuel rocket on March 16, 1926. And they are absolutely right. Everyone also knows how this paved the road to space by allowing the construction of rockets powerful enough to leave the earth. Well, maybe not so much. Before 1926, Goddard was a gung-ho proponent of space travel—and especially space travel by means of rocket propulsion. After all, he'd been working on developing high-altitude rockets—under a Smithsonian Grant, yet—since 1916 and had already received patents for a liquid fuel rocket and a step-rocket in 1914. Nor was Goddard particularly shy about promoting his ideas. In a 1920 article for Popular Science he described his scheme for hitting the moon with a rocket carrying a charge of flash powder (see the illustration). Goddard had calculated that although a visit to the moon via a manned rocket was still out of the question at the time he was writing, it would nevertheless be possible to "reach out a long arm and tickle the moon" by sending a charge of flash powder, the explosion of which could be observed from the earth. Through his experiments, Goddard had concluded that a minimum charge of 14 pounds was needed to make a visible flash visible. The magazine's editors commented that "Professor Goddard's improvement at a single step transfers the enterprise of hurling the missile to the moon from the class of impractical dreams to the domain of comparatively simple tasks." The press went nuts with the Goddard story. Newspapers and magazines ate it up. Goddard found himself labeled the "Moon Rocket Man" in headlines around the world. And that is where things started to go wrong. Although the Popular Science article inspired at least eighteen people to write to Goddard to volunteer for the first flight to the moon, others looked on Goddard's ideas with a more jaundiced eye. The London Graphic, for instance,immediately published a critique of Goddard's plans for high-altitude and moon-rockets. Some of the objections included the impossibility of safely returning instruments or passengers from such great heights, what the value might be of such an experiment, how the rocket could be protected from atmospheric friction since, " . . . bodies when they speed through the air are subject to friction against the air which is sufficient to generate tremendous heat," with the result that "the rocket will generate a red heat foremost of the first hundred miles." At a speed of 6.4 mps, the Graphic believed, the rocket would "vanish in an incandescent wisp of flame and smoke." Another objection to the moon rocket was that the moon and the earth are moving in different directions and at high speeds, and that there are "incalculable vagaries of air currents" above 20 miles that would make steering the rocket impossible. Even the New York Times chimed in, chastising Goddard for believing that rockets would work in space where they had no air to "push against." The article finished by saying that Goddard "only seems to lack the knowledge ladled out daily in high schools." Goddard replied to these and other objections in an article for Scientific American, but to very little avail. International celebrity on the one hand and ignorant criticism on the other was too much for a shy professor of physics at a small New England college. He withdrew from the world like a frightened turtle. He refused to not only talk about his work, he refused to publish anything about it, either. He began working in strict secrecy, as far from civilization as he could get, allowing little if any news of his work to be available to other researchers. And as he entered the 1930s and 40s, Goddard grew ever more secretive and paranoid, eventually moving his work to a remote location in the desert near Roswell, NM (make of that what you will). Serious rocketeers both in the US and Europe were left flummoxed. They knew Goddard was accomplishing great things...they just didn't know how he was doing it. They were left to reinvent from scratch everything Goddard had done. Thus the construction and launch of Europe's first liquid fuel rocket (and the first anywhere since Goddard's) was delayed until 1931. Built by German engineer Johannes Winkler the two-foot rocket achieved an altitude of nearly 300 feet. Winkler was a member of one the three highly influential rocket societies that had been organized during the 1920s and 30s. The Verein für Raumschiffarht (or VfR, the German Society for Spaceship Travel), the American Interplanetary Society (later the American Rocket Society) and the British Interplanetary Society (the only one of the three to exist in more or less its original form today). The first two of these performed many of the earliest serious and controlled liquid fuel rocket experiments. Unlike Goddard, however, these societies were entirely open and freely shared the results of their experiments. The VfR was eventually subsumed by the German military in the decade preceding World War II. Many of its members were recruited into developing the V2 and other giant rockets at Peenemunde. After the war, the V2 became the model for both US and Soviet rocket development, with most early rockets, such as the US Viking and Vanguard and the Soviet R-1, being derivatives of the German missile. It wasn't until well into the late 50s and 60s that entirely new designs were evolved. Even these benefitted, however, from the earlier German research...research that in turn had been based on the work of amateur experimenters who had been trying to duplicate Goddard's achievements.